This is a great family sized home, ideal for two families and conveniently located in Acacia Bay. The house sits at the rear of a large section, perfect for backyard cricket or parking the cars, boats and jet skis. This unique u shaped home is situated on one level and includes an open plan lounge, kitchen and dining area. The kitchen has all the usual mod cons and there is a large family dining table and ample couches for everyone to watch the TV. The bedrooms allows for the adults to have their own room, there is also a bunk room for the kids to enjoy. Complete with a spacious family bathroom close to the bedrooms and an additional bathroom just off the kitchen. The boat ramp is just a short drive away and there is a local dairy, restaurant and cafe nearby. Also close by is L’Arte Cafe and Gallery a unique cafe and gallery that is set in a magical garden, complete with an outside mosaic living room. Uncovered, off street parking available. Please note steep driveway is not suitable for trailers. Amazing location, great for a summer stay. Amazing location, great for a summer stay. However the bedrooms were really cold due to the ill fitting louvre windows. Would book again in the summer months but will be staying well clear if the weather isn't warm. Location great and house is well equipped except it needs better fry pans as they are aluminium and not safe for use. I also think for the price you pay, rubbish bags with stickers should be provided. This is the norm in other baches i have stayed in. Location ideal, house was really good for our needs. Excellent location and views. Would recommend for 6 people given location of bedrooms. Overall, this was a fine place to stay - good heating, beautiful views, a good living space and kitchen. However, we were disappointed by the "fourth bedroom" - it is more of a thoroughfare with beds in it than a bedroom, and it really didn't work so well for us with needing to have a toddler sleep in there. This bedroom needs to be explained in the property listing. Also, the LPG bottle ran out, the switches to half of the house continually tripped and the laundry door wouldn't open. Comfortable and cosy bach with everything you may need and at an affordable rate, especially over the Easter holiday period. Beautiful views of the lake and short walking distance to the shore. 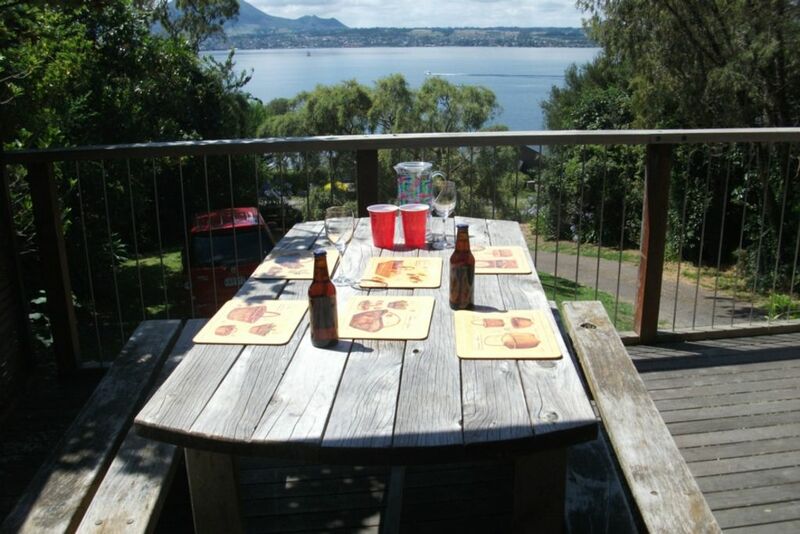 We have already recommended this place to friends and family and will most definitely hire it again for our next Taupo trip.